For men older than about 60, an enlarged prostate means feeling the urge to make a pit stop way too often throughout the day. But a new study shows that if these men also happen to have prostate cancer, the larger prostate actually impedes tumor growth.For men older than about 60, an enlarged prostate means feeling the urge to make a pit stop way too often throughout the day. But a new study shows that if these men also happen to have prostate cancer, the larger prostate actually impedes tumor growth. The findings suggest that it might be a bad idea to downsize an enlarged prostate through surgery or drugs, because doing so could lead to faster growth of prostate cancer. While the five-year survival rate for prostate cancer is generally very high, it is still one of the leading causes of death among men in the U.S., according to the Prostate Cancer Foundation. Computer simulations of patient data offer a possible explanation of why an enlarged prostate might be a life saver: because a prostate can only grow so much within a confined space, force accumulates and puts pressure on the tumor, effectively keeping it small. "It's already known that forces and stresses have an impact on tumor growth, and that patients with enlarged prostates tend to have slower cancer growth, but it wasn't known why," said Hector Gomez, associate professor of mechanical engineering at Purdue University, who builds models and simulations for understanding tumor growth, cellular migration and blood flow. 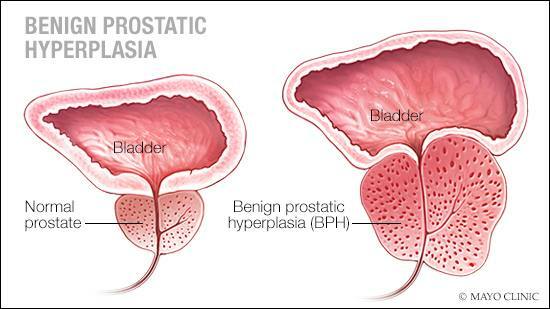 The study, published in the Proceedings of the National Academy of Sciences, is the first to simulate the possible effects of benign prostatic hyperplasia, a disease that causes the prostate to enlarge progressively, on the tumors of prostate cancer. Guillermo Lorenzo, a former doctoral student of Gomez who is now a postdoctoral researcher at the University of Pavia in Italy, performed most of the research and ran the simulations. Alessandro Reali and Pablo Dominguez-Frojan also participated in the study and are coauthors of the paper. Gomez and Thomas Hughes, a professor of aerospace engineering and engineering mechanics at The University of Texas at Austin, began the project as part of their work on using computer simulations to improve the diagnosis and prognosis of prostate cancer. "Current diagnosis and prognosis methods have had a hard time differentiating between patients who are under serious risk of prostate cancer and those who aren't," Gomez said. "This has led to people getting overtreated or undertreated." Looking at the relationship between prostate enlargement and prostate cancer could bring new insights. The study looked at data from patients in medical studies who had a history of both an enlarged prostate and prostate cancer. To perform the simulations, Lorenzo extracted a three-dimensional anatomy of the prostate and locations of the tumors from MRI images. At the end of a one-year period, the simulations showed that the tumor of a patient with history of an enlarged prostate barely grew at all. When the researchers removed history of an enlarged prostate in the program, the tumor had grown to be over six times larger at the end of the same time period. "But now we know that the mechanical stresses that originate as prostates enlarge impede tumor growth," Hughes said. Realistically, these findings would need to be clinically validated in humans through a long-term observational study before doctors take action. In the meantime, the researchers plan to extend their model to incorporating the effects of drugs that downsize the prostate, as well as use the model's information on the deformation of the prostate to help detect cancer.